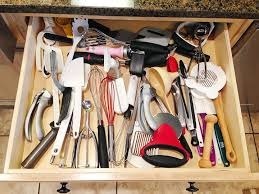 My frustration level reached a new high yesterday as I frantically rummaged through my utensil drawer looking for my vegetable peeler. Where the *%@# was that sneaky little bugger that always seems to be on the top of the pile?. It was no where to be found. After pulling out items I’ve not used this decade and finding a few things I’ve NEVER used, I’d had enough. Suddenly I had a brilliant idea. I surprise myself sometimes as my latent brilliance that only makes itself evident when I have HAD ENOUGH. I dumped the contents of the entire drawer into a packing box and placed it in my home office which has become my junk room since I got a laptop. My desk is used as the dumping ground for anything I can’t stand. But back to my jumbled-up over-stuffed drawer. I vowed not to put anything back into the drawer until I actually use it. I gave up sugar so that ice cream scoop won’t be used until I get some grandchildren who I will spoil with ice cream anytime they want it. Same for the melon baller which has never actually been used for making melon balls. I’ve used it as a makeshift ice pick on occasion. After 48 hours, these are the only utensils I’ve used. After a month or so I’ll know what needs to live in that drawer. Everything else will be stashed in the box in my office and maybe after a couple of months I’ll take it to the Salvation Army. Whatever’s in it must not be MY salvation. This entry was posted in Good housekeeping and tagged Clean out the kitchen, Organization 101. 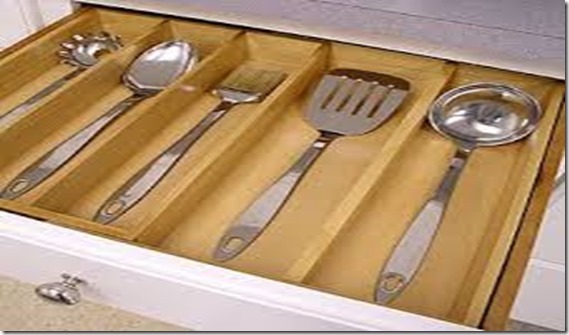 Solution to over-stuff drawers by Emily Jones. Bookmark the permalink. 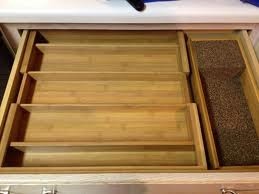 Emily,This is crazy,I did the same thing yesterday with MY junk drawer. We are on the same wave link.(HA). I all of a sudden feel like cleaning out drawers all over the house. It is really a good feeling. The tree is back in its resting place till next nov right after thanksgiving day, wreaths put away and spring ones out out on the porch. Whew now onto the yard my other favorite time of the year. So glad you came to our Mardi Gras! Looks good, now if you can avoid Bed, Bath, and Beyond. I go in there and I am like a tourist in N.Y City. The section where the have kitchen stuff and gadgets up the wall, I just stand and turn with my head tilted. I always find something I had lived ok without and never thought I needed. Hopefully you will do better at that than I do! Beverly, what a mardi gras it was! I lived through five fat Tuesdays in New Orleans and they could learn a thing or two from you! ” hiring girls for various positions “. Hilarious! I’m driving out there to make sure you’re not pulling my leg!!!! Wish I was that clever, but that was the message last week! Hope it’s still up. Knew you would appreciate since you climbed that stallion! Martha, I’ve been tempted to go in there with my camera and watch the place clear out. You wanna go with me – we can ride the stallion as an extra bonus.